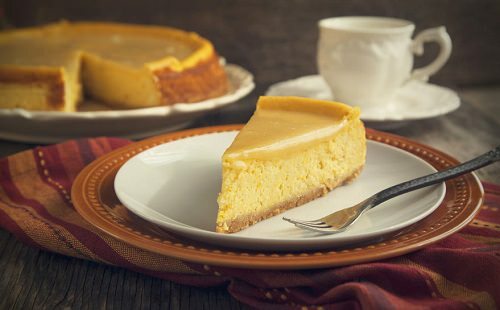 Such quite an unusual ingredient as pumpkin will turn a simple cheesecake into a very delicious and just amazing treat. You will definitely like it! Prepare the puree first and mind that it should not be watery, strain it through cheesecloth if needed. Preheat the oven to 500°F and butter the pan on the bottom and sides. I take a 9-inch springform pan. Ground the graham crackers in food processor, add pecans and brown sugar and melted butter, ground finely again. Press the mass into the bottom of the pan and bake about 8 minutes till it becomes light brown color. Let the crust cool. Combine sugar, salt, cinnamon, nutmeg, cloves in a small bowl. In another large bowl mix cream cheese till it gets very smooth, and add all the spices. After you combine it with pumpkin puree and mix until very smooth. Add eggs, but beat the cream after each addition. And the last goes lemon juice and vanilla, the mass should be like heavy cream. Put the substance onto the already baked and cooled crust and bake for 12 minutes. Then lower the temperature to 225°F and bake for 2 hours until its top gets brown but is still slightly jiggly. Let the cheesecake sit in the oven, cooling for another hour with the oven door open. After the cheesecake is of room temperature, refrigerate it for several hours, but better to leave it for the whole night. When ready to serve, run a sharp knife around the edges of the pan sides to loosen cheesecake and gently remove the cake from the springform pan. Cut it into slices and decorate with whipped cream.